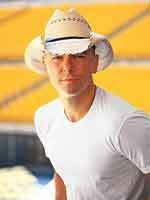 Kenny Chesney is a Country music superstar that has been a professional recording artist since 1994. He's recorded 20 albums with more than 40 top 10 singles. The singer/songwriter grew up in East Tennessee and he still calls Tennessee home, but he also has a residence in the U.S. Virgin Islands. Island–themed songs are found on various albums. He loves interact with his fans and has been known to have huge beach balls floating around in the crowds during his concerts at the Houston Rodeo. You will not want to miss this event so buy your tickets today!